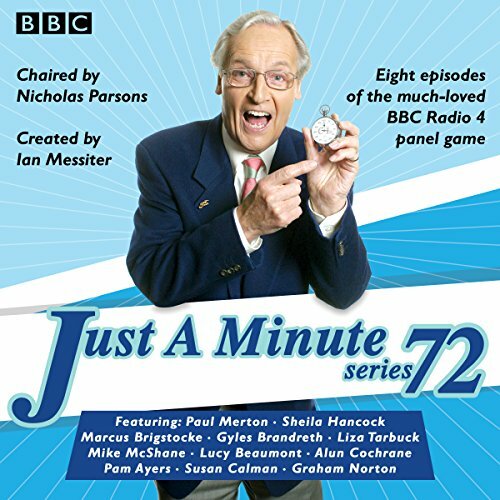 Eight episodes of the perennially popular BBC Radio 4 panel game, chaired by Nicholas Parsons. Just a Minute was born the same year as Radio 4 itself and is one of the longest-running and best-loved radio comedy shows. Hosted by the inimitable Nicholas Parsons, it tasks contestants to speak for 60 seconds on any given topic "without repetition, hesitation or deviation". In this 72nd series, the subjects covered include English sparkling wine, crows' feet, Nelson's column and Alice in Wonderland. Among the guests are Paul Merton, Liza Tarbuck, Graham Norton, Sheila Hancock, Pam Ayres and Tim Rice, who returns to the show for the first time since 2009. Under the watchful eye of the chairman, they must fend off challenges and win the points using only their wit, ingenuity and improvisational skills. Can they go the full minute? You'll have to listen to find out!